BeHir Relation was not the one that was arranged or pre-planned but it was destined. The care, concern, admiration, protectiveness & possessiveness started to appear in behir life, while one was trying to understand these feelings the other was trying too hard to resist them. It was the scene after which Bela started being protective towards Mahir. This shower scene depicts their acceptance of love. This scene shows how Bela feels that no matter how much she tries, she can’t do anything right & always ends up hurting him. She wants to be there for him, to make him happy but she thinks she fails to do that but in reality, her being with him is all he ever needs. That was portrayed so beautifully by Surbhi Jyoti & Pearl V Puri. There has not been an official confession of love between them but both are aware of the feelings of one another. How there is no hesitance/shyness or awkwardness even though being that close to each other makes BeHir special. 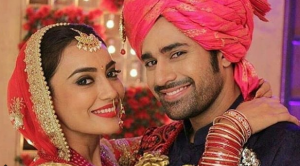 BeHir are Normal, Real that makes you connect with the characters & also So, Intense & Passionate that makes you LOVe them more……. One more question I think the Vikrant re-entry track was not executed in a proper way. Some of the readers asked me to write about that, what do you all think?? You don’t really need coding expertise to start a blog. you can start your blog on WordPress it will provide you with themes which you can easily customize as per your wish, you don’t have to deal with HTML code. if you need guidance do let me know.